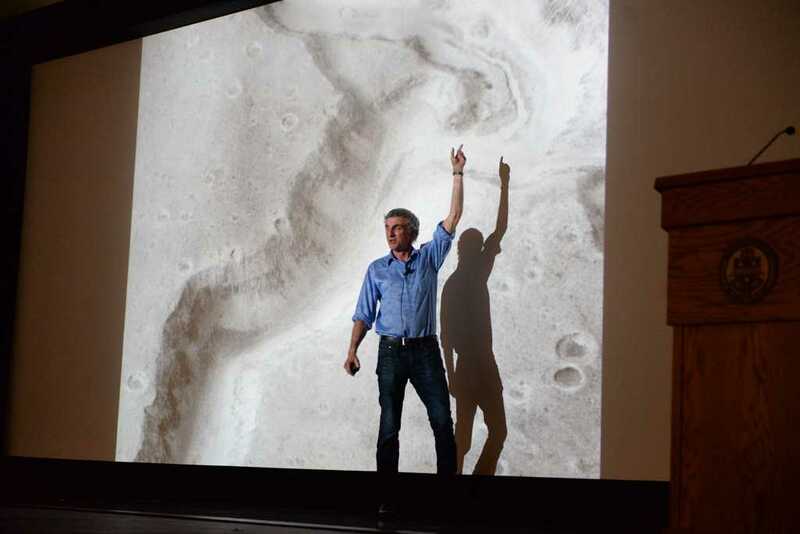 If the Mars rover hadn’t landed smoothly, Steven Squyres said he would likely be in therapy. Squyres, the principal investigator for the Mars Exploration Rover that successfully touched down on the Red Planet in 2012, had been perfecting the robot since NASA had first granted him funding in the late ’90s. On the night the Rover finally landed, Squyres’ heart leapt. Because the robot was so far away from Earth, there was a several-minute delay as the radio signals traveled, so Squyres and his team of engineers often sat, waiting for something to happen. A bad gust of wind, a pointy rock— anything could have destroyed the rover. But then it touched down, and several minutes later when the signal came through, Squyres and team cheered. Their experiment had worked. Squyres, born in 1956, has worked on NASA explorations since 1978, beginning as an assistant on the team that sent the Voyager robot to Jupiter and Saturn. After almost 10 years at NASA, Squyres began writing grants requesting money to send a robot to Mars and designed hardware for the Martian environment, finally getting the go-ahead in 1987. After 16 years, he and his team launched two rovers, Spirit and Opportunity, into space in 2003. Although Squyres’ team built the robots for a 90-day mission to explore the surface of Mars, both outlasted their expected survival time. Although the team last heard from the Spirit Rover in 2010, the Opportunity Rover is still exploring and reporting back to its creators on Earth. Through his and his team’s work, Squyres was finally able to look at the blank canvas of the Red Planet. The Pitt News: I imagine you remember the day of the rover landing really well. Can you tell me a little about that? Stephen Squyres: It was around midnight. I was in the control room, but the name “control room” is a bit of a misnomer in this case because we had no control. We were just spectators who had better seats than anybody else. When the landing took place, Mars was so far away that it took about 10 minutes for a radio signal traveling at the speed of light to get from Mars to Earth. And so you know, we’re looking at the radio signal, we’re watching to try to figure out what’s happening on Mars, but what we’re seeing is something that happened 10 minutes ago. And the actual landing process from when you first hit the top of the launch atmosphere to when you’re on the Martian surface only takes about six minutes. So we’re sitting there in the quote-unquote control room with no control at all, and we’re watching the radio signal and we’re looking for the Doppler shift that shows if the spacecraft is starting to slow down as it enters the Martian atmosphere. We see that starting to happen, and the reality is our spacecraft has been on the surface of Mars for four minutes, we have no idea what kind of shape it’s in. It could have been smashed to pieces, could be perfectly happy and successful, and there was no way of knowing. So it was a very strange feeling because we had absolutely no control whatsoever over what was going on. So your heart’s kind of in your throat, you know. At the point that we were watching that landing in the control room there, I had put the last 16 years of my career into trying to make this happen, and it was all going to succeed or fail on the basis of did we design it right, did we build it right and did we not get unlucky. I mean, you can build a perfect vehicle, you can have it function exactly as designed and Mars can still kill you. A bad gust of wind, a sharp pointed rock in the wrong place, and you’re history. And so it was, it was real good, it was a real good feeling when we got the radio signal from the vehicle saying it was safely on the surface. It’s a hard thing to describe. It really is a hard thing to describe. TPN: Who was the first non-NASA person you told about the landing or talked to after the landing? SS: Well, it went out live on national TV, so the whole world was watching. The very first phone call I made was to my wife. I didn’t want to call my parents because it was so late at night on the East Coast, so I doubt they were up anyway. But yeah, that’s what you do, you call your family. TPN: How did your family react to the news? SS: I think just enormously relieved. It had become … it was a real family project. My kids were at the launch [in 2003]. At the time we landed [in 2012], my kids were in their teens, and I had been working on this thing their entire lives, since before they were born. And so I think they were all just very, very relieved that it worked. I would’ve been in therapy for years if the thing hadn’t. It was an enormous relief for everybody I think. TPN: Can you talk a little bit about the discoveries you and your team have made since the rover landed? SS: The fundamental focus of our mission has to do with whether or not Mars was once a habitable world. It’s a very cold and dry and desolate place today. But what we’ve learned is that at both of our landing sites, in very different ways, Mars was once habitable. At both landing sites, it was lick of water, it was warmer, it was present at the surface, it was present under conditions that would have been suitable for some forms of life. It doesn’t say that life was there. There’s a big, big difference between being habitable and being inhabited, and we can’t say whether or not life existed there. But what we’ve been able to show by sort of reading the story in the rocks at these two landing sites is that the conditions would have been favorable for life at some point in the past. TPN: Tell me a little about your position. What exactly do you do? SS: I’m what’s called the principal investigator for the Mars Exploration Rover project. So what that meant before we launched was that I was the one responsible for leading the team that developed and built and tested all of the scientific hardware on the rovers — so the cameras, the other instruments, that kind of stuff. And then once we got to Mars, I lead the team that decides each day where to go, what to do — you know, what pictures to take, what data to collect and get down to the ground and then analyze the data and publish the papers. TPN: How did you end up there? SS: Writing lots and lots of proposals. I spent 10 years, from 1987 to 1997, writing a series of proposals to NASA to try to convince them to do something like this vision. We finally got selected in 1997, and then the program changed quite a bit, it sort of got canceled and brought back to life several times for about three years. But in 2000 NASA finally said, “OK, we’re going to do this, we’re going to do this for real, we’re going to do it with two rovers — ready, set, go.” And we had to be on top of the rockets in Florida 34 months later. So it was a long road just to get to the launch pad. TPN: Starting out in your undergraduate career, did you always know you wanted to go into space? SS: No, no I didn’t. I loved doing science, and I loved climbing mountains. And so as an undergraduate major, I picked geology because I figured it would be a way to combine the two. But what I realized after two of three years of studying geology was that a lot of the really interesting problems on Earth had already been figured out. And that sort of, that sort of bothered me. I wanted to work some place where there were just big questions nobody knew the answers to. And I was sort of drifting toward something involving maybe the geology of the seafloor or something like that or go to some place on Earth that was poorly explored compared to the rest of the planet. But then what happened was my junior year as an undergraduate, I took a course on the Viking Mission to Mars, 1977. And there was a professor in the astronomy department at Cornell who was a member of the science team for the Viking mission. It was a graduate-level course, so I wasn’t really supposed to be in it — I kind of talked my way in. And because it was a graduate-level course, you’re expected to do some kind of original research for your term paper. And so it’s getting three or four weeks into the semester, and I figured I better start thinking about my term paper, so the professor gave me a key to a place that was called the Mars Room, which is where all the pictures from the Viking spacecraft were kept. This is before Internet or CD-ROM or any of that, so that data from the spacecraft was just distributed to the team on these big rolls of photographic paper. And I went into that room thinking I would flip through pictures for 15 or 20 minutes and maybe come up with a topic for a term paper, but I walked out of the room four hours later knowing exactly what I wanted to do with the rest of my life. It was a revelation. I mean, I didn’t understand what I was seeing in the pictures — it was the first time I’d ever seen pictures of Mars really — but the beauty of it was nobody understood it, and so this was sort of the blank canvas I’d been looking for. TPN: What’s the most fun part of your job? SS: The most fun part of my job, now, is the business of getting to be part of the team on this planet that decides each day what’s going to happen on that planet. You take a look at the pictures, and you look around and you say, “That looks interesting, let’s go there.” And then you get up the next morning, and you open your laptop, and you make yourself a cup of coffee, and you sit down on the couch, and you go to the downlink that came down overnight, and you get to see something that no human being has ever seen before. And that’s really cool. TPN: What’s the most difficult part? SS: From ’87 to ’97 — that decade of writing proposals — was very difficult, very unpleasant. It was rough. Since then, since we got selected and got the opportunity to do this, I don’t know, “difficult” is not the right word. “Challenging” would be a good word for much of what we do … so the only part I would say was really difficult was, in the way I would normally use that word, was the proposal writing. I didn’t enjoy that at all. TPN: Tell me about some of your other missions. I read you were an aquanaut? SS: I wanted to be an explorer, right? That’s why I became a geologist, but the problem with choosing Mars exploration as my primary focus is that you can only do that with robots. And so one thing that I have done over the years to kind of scratch that itch a little bit is get myself involved in various expeditions of various sorts to interesting places on Earth. NASA has a program called NEEMO — stands for NASA Extreme Environment Mission Operations — and it serves two functions. One function is a training opportunity for astronauts. A NEEMO mission is conducted underwater: The crew lives underwater two weeks or so in a habitat called “Aquarius,” which is an underwater habitat laboratory off the coast of Florida. It’s a terrific opportunity because it’s a very, very, very good simulation of what it’s like to be in space. The isolation, the confinement, you have a very rigid timeline of activities for the mission. It’s very, very flight-like. The other thing they use it for though is NASA uses it to conduct forms of research. So I was very fortunate — I got to be a crew member on two NEEMO missions — NEEMO 15 and NEEMO 16 — just a few years ago. I was the only non-astronaut on the crew. So each crew that I was on consisted of three astronauts plus me. And what we were doing on my mission was simulating asteroid exploration. When humans first go to asteroids, most of the asteroids that you can imagine being able to send humans to are very small objects, maybe a few kilometers in size or something like that. And what that means is they have effectively zero gravity. They’re so small that their gravity fields are extremely weak. So then the question becomes: How do you conduct geologic exploration in zero gravity? You know, something as simple as hitting a rock with a hammer is going to send you flying when there’s no gravity to hold you in place. We have lots of experience doing geologic exploration in spacesuits on the moon, but the moon has ⅙ gravity, you can walk around. We have lots of experience with doing spacewalks on the space shuttle and the International Space Station, but asteroids don’t have handrails. So the business of how you conduct exploration in zero gravity is not something that anybody knows how to do. And astronauts get in spacesuits, get in the water and they get trimmed out so they’re neutrally buoyant and so it’s like they’re floating in space, and they train and learn how to space walk there. And so the idea was to use the neutral buoyancy afforded by being underwater to do simulated spacewalks outside the Aquarius habitat and to practice and evaluate different possible techniques for how to do exploration on a low-gravity asteroid. So as you can imagine, it was a very interesting way to spend a couple of weeks. 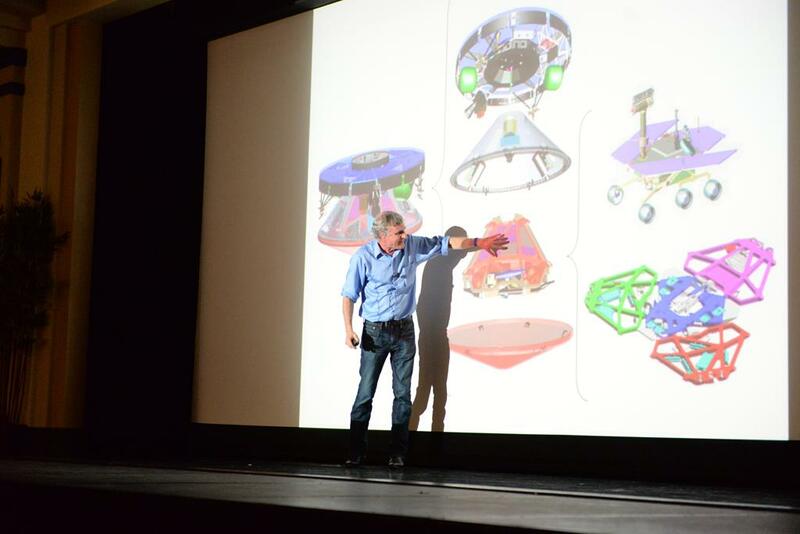 When Squyres visited Pitt in October, several students were able to ask him questions about his work on Mars. Below is one of those questions. Student: Do you think you’ll see a colony of humans on Mars in your lifetime? SS: “Colony,” let’s think about that word for a moment. Generally, “colony” means permanent habitation, meaning people live their lives there, have their children there. Okay, generations are born and so forth. I don’t expect to see true colonization of Mars in my lifetime, you know, people going out there intending to live out the rest of their lives and raise their children there. I mean, people haven’t colonized Antarctica yet because it’s a terrible place, and Mars is much, much, much worse than Antarctica as a place to live. So colonization I think may be a long way off. I do hope — I’m eating healthy foods, getting plenty of exercise — I’m hoping to live to see humans set foot on Mars. And I think what we’ll probably see on Mars is very much analogous to what we have on Antarctica where there are research bases, there are expeditions. People go there to do research, and they come back. There are research bases that are set up, there are permanent fixtures that are set up. And people go there and live for a while, they do their research and they come back. I’m actually a little bit skeptical about whether or not people are going to want to colonize Mars in the sense of really living there. It’s kind of a dramatic notion. But I think many people underestimate just how difficult and unpleasant a place Mars really is. It’s a brutal, brutal place. It would be a terribly difficult place to try to live, and I think when really confronted by the reality of living on Mars, especially about raising your children there and starting a true colony, it’s an awfully harsh environment.